Kazan, the capital of the Republic of Tatarstan (719 kilometers from Moscow), is a city whose cultural heritage is made up of several layers and where different religions are intertwined in unusual ways. This is reflected not just by the centuries of coexistence of Orthodox Christians and Muslims, or by the eclectic Temple of All Religions, but also by the bilingual (Russian-Tatar) street signs. 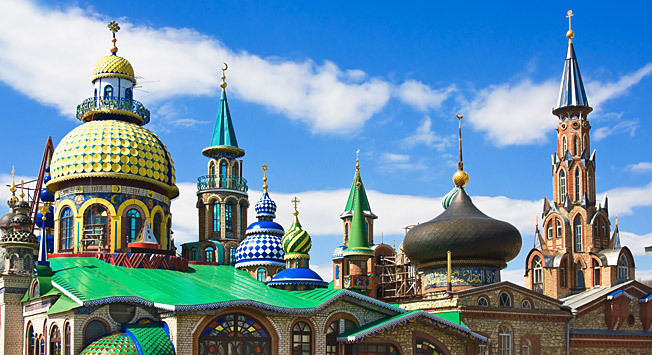 Photo credit: Lori/Legion-Media There was a white mosque with blue domes and several minarets before Ivan the Terrible’s conquest of Kazan in 1552 in the area of the Kremlin. At the time it was the capital of the Kazan Khanate. Four and a half centuries later the authorities decided to rebuild it. The opening of the mosque took place on June 24, 2005 in honor of Kazan’s Millennium Jubilee. Since then it has become the new symbol of the city and the republic. Today innumerable sport facilities are available not only to professional sportspeople, but also to tourists and to local people: Besides watching competitions and using the various facilities, you can just enjoy the latter as urban sights and book an excursion by van or by minibus (from 4,000 to 16,000 rubles for a 4-hour tour).